STEVENS POINT, Wis. (November 1, 2017)—The Stevens Point Area Convention & Visitors Bureau (SPACVB) has announced the winner of its Central Wisconsin Craft Collective Sweepstakes. Jennifer Wensink of Sheboygan, Wisconsin, is the winner of a Craft Collective getaway including a two-night stay, tours and tastings with the members, transportation and more. The Central Wisconsin Craft Collective links several breweries, wineries and a distillery all located in the Stevens Point Area. Members include Central Waters Brewing Company, Great Northern Distilling, Kozy Yak Brewery & Winery, O’so Brewing Company, Stevens Point Brewery and Sunset Point Winery. While the sweepstakes has ended, you can still take the quiz to determine which member you’re most like on the Craft Collective website, CWCraftCollective.com. Quiz takers will have the opportunity to view short videos about the Craft Collective members and will also receive a personalized Stevens Point Area getaway itinerary filled with attractions and restaurants based on their Craft Collective personality. The Craft Collective Sweepstakes wraps up the successful promotions for the Stevens Point Area for the calendar year. 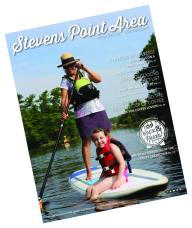 In 2017, the Stevens Point Area had three giveaways with nearly 4,000 entries from fans eager to experience the area for themselves. For those who didn’t win, the SPACVB is planning more great giveaways in 2018, so become a fan of the Stevens Point Area Facebook page or visit their website for updates on your next chance to win.